Here is perhaps my biggest pet peeve when it comes to golf course architecture. The photo above is in the landing area of a par 4 hole that doglegs to the left. It’s a medium-length hole, maybe in the short to medium range. As you can see above, my golf ball is in the fairway. It’s on the left side of the fairway, but it is certainly safely in the fairway. It isn’t a situation where I just snuck it inside the line where the fairway ends and the rough begins. You can also see the group in front of us standing on the green. The hole was located left of where the guy in the white (on the right) is standing. So what’s in between me and the green. Yep, those would be trees. Directly in my way. Despite the fact that I’m in the fairway. And that makes me want to scream. If I had to wager five bucks, I’m guessing these trees were planted in the ’80s in an attempt to force golfers to heed the dogleg instead of just blasting directly at the green from the tee. I can understand that, but at some point the treens have gotten in control. My feelings on this are pretty simple. If my ball is in the fairway and I can stand in the fairway when I hit my shot, I shouldn’t have to deal with tree trouble — or at least tree trouble to this extent. It would be one thing if there was a branch or two I had to hit over or under or work around, but this is too much. My feeling is that I’d like to see the two trees closest to the fairway removed. This is a course I have played four or five times over the past decade. I know just enough to be dangerous. When I don’t have a tone of course knowledge, my strategy is to try to hit the fairway and then try to hit the green. The fairway, to me, equals a safe place and you shouldn’t be penalized. So let’s say that the club wants to keep the trees as they are. Well, that’s fine. But then you need to move the fairway further to the right and away from the corner. I realize I might be a rare person who feels this way, but I don’t think you should be penalized for hitting it in the fairway. In this case, I had to attempt to hook the living daylights out of a 9-iron. 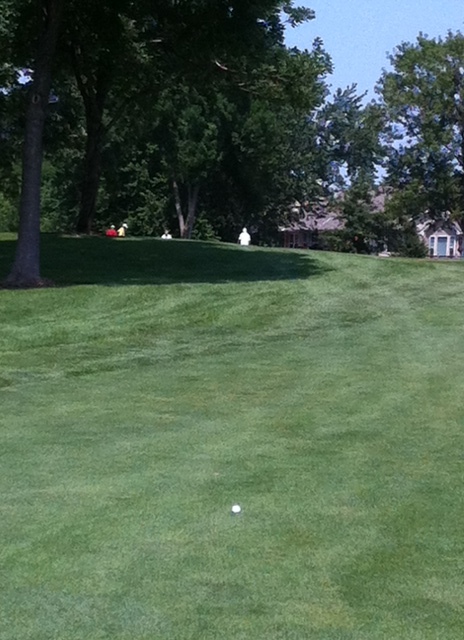 I got the ball on the front right corner of the green, but was about 3,953 feet from the pin. Yes, I three-slapped it for bogey. OK rant over. But it is still a ridiculous feature. Why can’t more golf courses do this? You could achieve the same result utilizing bunkers for those swashbucklers attempting to cut the corner. I think its more defensible the shorter the hole but the picture above is absolutely criminal. Take a page from Oakmont….. There is actually a bunker on the outside of the dogleg. I agree that bunkers on the inside of the dogleg would be just fine. Obviously I’m on the left half of the fairway in that photo, but you shouldn’t force golfers to hit a specific half of the fairway. Why SHOULDN’T a golfer be required to hit a specific half of the fairway, especially on a short par-4 — or deal with the consequences of hitting to the “wrong” side of the fairway? It’s not as though one CAN’T make par from where you were, as you demonstrated (or could have, anyway). It looks to me as though you had multiple non-penal options, once you’d hit your tee shot there. I’m not saying I LIKE being blocked by trees. I AM saying I see nothing theoretically wrong with demanding that one hit one side of the fairway or the other, or pay the price for not doing so. Example: Oak Ridge No. 2. I appreciate your thoughts. In this case the hole is No. 15 at Brackett’s Crossing. It is 430 from the back tees and 383 from the white tees (where we played that day). I wouldn’t characterize that as a short par-4. While I don’t think that there is anything wrong with a golfer being required to hit a specific half of the fairway, I prefer golf courses where golfers are rewarded for hitting the correct part of the fairway. If you are willing to challenge a bunker or hazard for example and you get a better angle/shot at the green. I like that much more than making hitting one side of the fairway with a decently struck tee ball and not having a whole lot of a shot. In this case, I was at least 20 percent of the way into the fairway. That’s much different than having your ball in fairway and you standing in the rough. I wouldn’t say that I had multiple non-penal options because the green is elevated making the ground game a very small percentage shot. I had a very small portion of the green to aim at, less than 25 percent. My feeling is that if your ball is in the fairway in the true landing area, you should have a clear shot at at least 50 percent (and probably closer to 75 percent) of the green. If you’re in the rough, all bets are off, but that’s not the case here. And even if I had made par, I still don’t think it is a good hole. Now about the bunker, it doesn’t really bother me. It actually provides a nice aiming point for the golfer as it is a gentle dogleg rather than a sharp dogleg. You characterized it as a short-to-medium length par-4. I wouldn’t call that a short par-4, either. I agree with you that a hole that long shouldn’t require a shot to one half of the fairway. You did have multiple options — though you might not have had multiple options to hit the green. Again, if this were a short par-4, I’d say: So what if you can’t hit the green, if you don’t put it on the proper side of the fairway? I seriously disagree with your view of the bunker. Bunkers should be hazards, not aiming points. I look at that aerial, and I think that bunker is ridiculous! It’s one of Mike Cirba’s anti-strategic bunkers. Why should you have a bunker designed to punish the smart, prudent drive? Those trees should be cut down if prohibiting play from the fairway. It looks like textbook tree overgrowth to me.